After a great run at Kalyani Nagar, Callow opens its doors at Koregaon Park in Lane No. 5, opposite Laxmi Temple. It’s no news that Callow boasts of a very young and vibrant vibe with it’s quaint pastel decor, fairy lights and pretty seating arrangements. The food menu continues to main a fresh and green mantra. We recommend you try the watermelon and feta salad for INR 250, bruschetta for INR 200, chocolate fondue for INR 750 and the thin crust veggie farmhouse pizza for INR 250. Want to take a walk down the memory lane? Must-try their fluffy pink candy floss for INR 200. For those fitness enthusiasts, we highly recommend you order the Callow-special skinny me drink, a combination of apple, beetroot, carrot and plum. The popsicles out here are absolute love. We still can’t get over their coke float, orange raspberry and peach tea popsicles for INR 100 each. 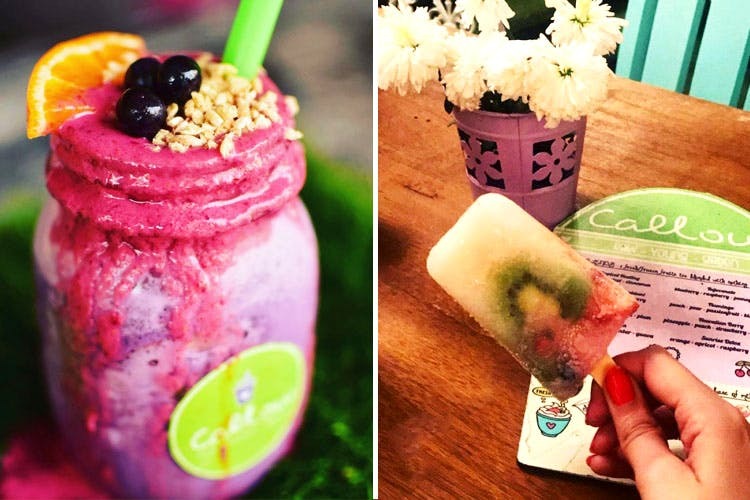 Gourmet pastas, healthy veggie salads, colorful popsicle and big fluffy candy floss, head to Callow on your cheat days!